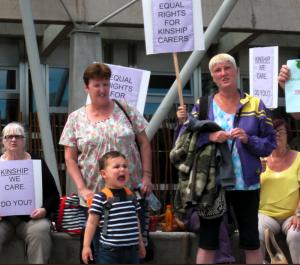 Around 40 kinship carers and their supporters from across the Scottish regions descended on the Scottish Parliament today chanting and singing loudly. They held banners and placards telling the SNP government to stop their plans for Kinship Care in the proposed in the Children and Young People Act, which the Scottish Kinship Care Alliance claim will maintain and even increase the differential treatment of children in foster care and kinship care with comparable needs. The angry group of kinship carers from the Scottish Kinship Care Alliance questioned the SNP government’s commitment to ‘make Scotland the best place for children to grow up’, claiming that the vulnerable children in their care are discriminated against and under-supported. Other placards stated that discrimination between foster and kinship children is a violation of the European Convention on Human Rights. Aileen Campbell MSP, Minister for Children and Young People, met with a delegation from the Alliance on Thursday evening to hear their concerns but did not promise any changes to the legislation which is being developed, angering the Alliance further. This entry was posted in Event, Kinship Care, News, Protest and tagged Buttle UK, care, children, Children and Young People Bill, demonstration, discrimination, foster care, human rights, informal kinship care, kinship allowance, kinship care, Local Authorities, Munby judgement, petition, policy, postcode lottery, poverty, protest, psychological services, Scotland, scottish government, Scottish Kinship Care Alliance on June 20, 2014 by Miriam Rose. 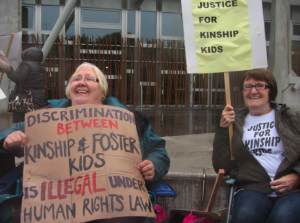 Please join Kinship Carers from across Scotland outside the Scottish Parliament on Friday 20th June at midday to tell the Scottish Government to stop their plans to continue discrimination against children in kinship care in the new Children and Young People Act. Please be there in your numbers with placards and banners and loud voices! – to stop discriminating between children in kinship care and foster care in the new Children and Young People Act. – to stop plans to reduce, or fail to increase basic support services and financial allowances for kinship children in poverty and affected by trauma in the new Act. – that this discrimination is a violation of the European Convention on Human Rights, articles 8 and 14. – that ALL children in kinship care should be treated the same as comparable children in foster care with the same access to services and support. Our full response to the Scottish Government’s Secondary Legislation can be seen here. We will be highlighting these points at the demonstration. Please share this far and wide on facebook, twitter and email! This entry was posted in Event, Kinship Care, News, Protest and tagged children, Children and Young People Bill, consultation response, demonstration, discrimination, foster care, human rights, kinship allowance, kinship care, policy, postcode lottery, poverty, protest, psychological services, Scotland, scottish government, Scottish Kinship Care Alliance on June 10, 2014 by Miriam Rose. The Scottish Government has now given its reply to the 48 Parliamentary Questions on Kinship Care filed by seven MSPs from cross parties in September. The replies confirm much of what we already knew: that the Scottish Government has not adequately researched the needs of children in Kinship Care, or the success of its initiatives to support them to date; that there is discrimination between the support offered to children in Foster and formal Kinship Care on the same legal standing who have comparable needs; and that provision for the majority of children in Kinship Care who are on section 11 orders or none at all is virtually non-existent. The report below gives more detail on the answers and some of the issues raised. The full list of questions and answers can also be found at the bottom of this post. This entry was posted in Article, Kinship Care and tagged Buttle UK, care, children, consultation response, discrimination, family foster care, foster care, human rights, informal kinship care, kinship allowance, kinship care, legal precedent, Munby judgement, policy, psychological services, Scotland, scottish government, Scottish Kinship Care Alliance, Social Work, UK government, Westminster on November 26, 2013 by Miriam Rose. 48 Parliamentary Questions on the issue of Kinship Care have been lodged in the business bulletin of the Scottish Parliament by a group of cross party MSPs. 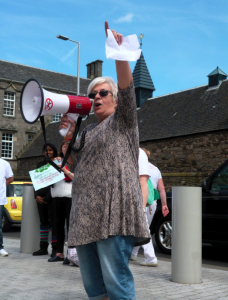 Six questions were lodged on Friday last week by John Finnie (Independent), while the remaining 42 appeared in yesterday’s bulletin, while more than 100 Kinship Carers chanted and protested outside the parliament. The questions were lodged by Jean Urquhart (Independent), Neil Bibby (Labour), Michael McMahon (Labour), Jackie Baillie (Labour), Alison Johnstone (Green Party), Bob Doris (SNP). The full list of questions is below. This entry was posted in Event, Kinship Care, News and tagged children, consultation response, demonstration, discrimination, family foster care, foster care, Glasgow City Council, human rights, informal kinship care, kinship allowance, kinship care, legal precedent, Munby judgement, policy, poverty, protest, psychological services, Scotland, scottish government, Scottish Kinship Care Alliance, Social Work, Westminster on September 26, 2013 by Miriam Rose. Today more than 100 Kinship Carers and their supporters from across the Scottish regions descended on the Scottish Parliament demanding fair treatment for the children in their care. Carers came from Angus, Stirling, Kirkcaldy, Falkirk, Edinburgh, Mid Lothian, Glasgow, Dumfries, Inverclyde and West Dunbartonshire. They chanted slogans such as ‘We won’t stop, we will fight, Kinship kids have human rights!’, and ‘Scottish Government: Shame on you!’, sung songs and held banners and placards with various demands. 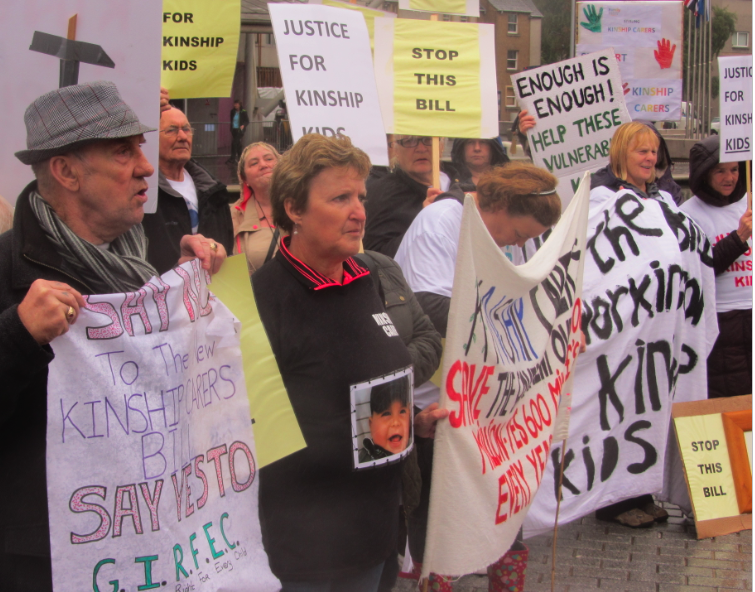 Many placards stated ‘justice for kinship kids’, while others said ‘Kinship kids are humans. Stop the discrimination!”. The National Day of Action was declared by the Scottish Kinship Care Alliance – the national body representing Kinship Carers across Scotland. 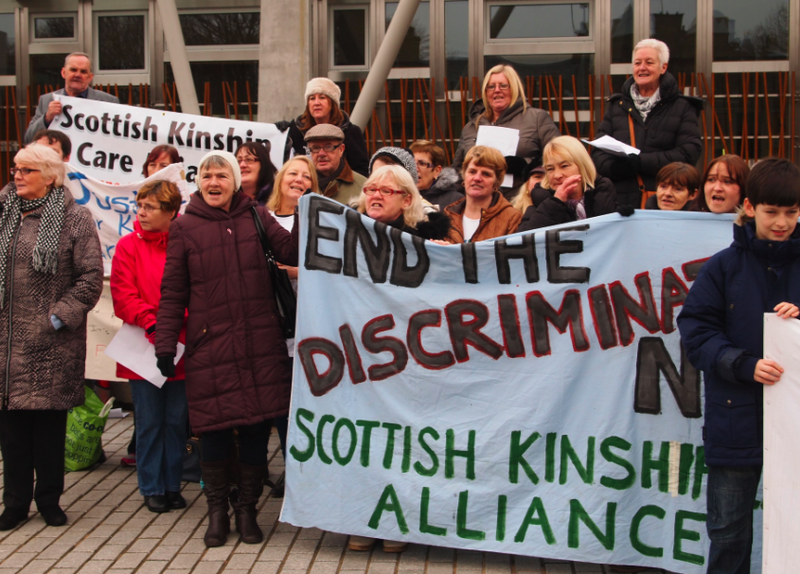 A Kinship Care support group for North Ayrshire simultaneously protested outside the Irvine council offices as part of the Day of Action. Please see below for pictures, a full report, and links to the huge amount of press coverage we received! Massive thanks to everyone who made today possible.. This entry was posted in Event, Kinship Care, News, Protest and tagged Buttle UK, care, children, consultation response, demonstration, discrimination, foster care, human rights, informal kinship care, kinship allowance, kinship care, policy, poverty, protest, psychological services, Scotland, scottish government, Scottish Kinship Care Alliance on September 25, 2013 by Miriam Rose. Kinship Carer Eleanor Brownlie from West Glasgow spoke to the Herald. MORE than 100 grandparents will demand local authorities are given funding to support those who look after their ­vulnerable young relatives as they protest outside the Scottish Parliament. They say kinship carers such as themselves are discriminated against by being denied many of the supports offered to foster carers, including basic financial allowances, educational support and child therapy. 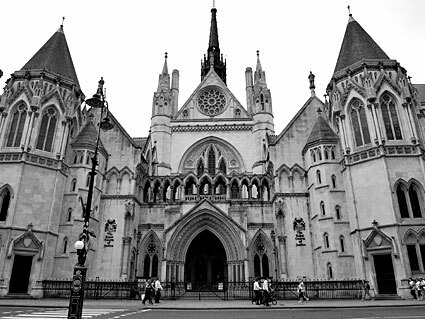 This entry was posted in Article, Kinship Care, News, Protest and tagged Buttle UK, care, children, demonstration, discrimination, foster care, human rights, informal kinship care, kinship allowance, kinship care, policy, poverty, protest, psychological services, Scotland, scottish government, Scottish Kinship Care Alliance on September 23, 2013 by Miriam Rose. 25th September, 11.30am – 12.30pm. The Scottish Parliament, Edinburgh. Join us to tell the Scottish Government to stop discriminating against tens of thousands children in Kinship Care, and invest in supporting some of Scotland’s most vulnerable children. Parallel local demonstrations will be held in other Scottish regions. Please join us with placards, banners and loud voices! 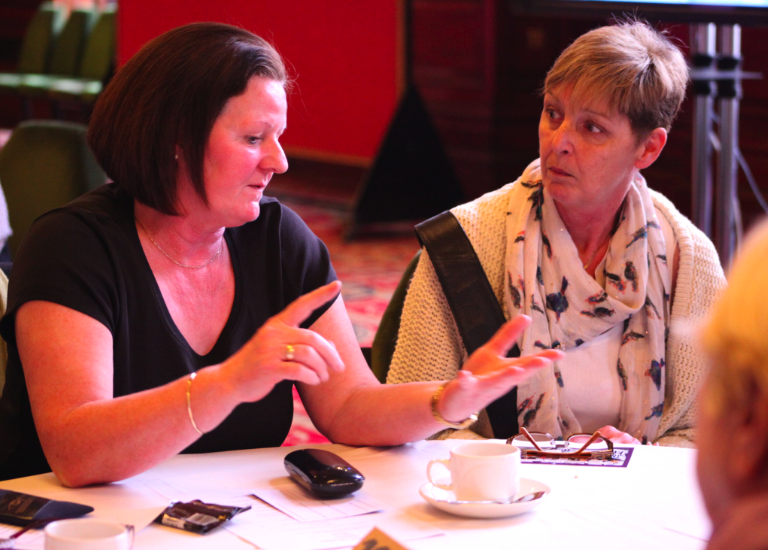 We need to show that Kinship Carers are not an isolated group, but have wide support. Come show your solidarity! 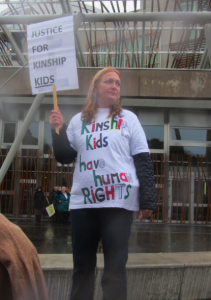 This entry was posted in Event, Kinship Care, Protest and tagged children, demonstration, discrimination, human rights, kinship care, protest, psychological services, Scotland, scottish government, Scottish Kinship Care Alliance on September 16, 2013 by Miriam Rose. 29th July 2013. On Friday the Scottish Kinship Care Alliance submitted its comprehensive response to the Education and Culture Committee’s call for evidence on the Children and Young People’s Bill. In April the Scottish Government released more information on the new measures for Kinship Carers which is had proposed in the Bill. This revealed that far from increasing provisions for some of Scotland’s most vulnerable children who are in Kinship Care, they are intending to save money and decrease the support available! This will largely be achieved by taking children off Looked After status (which is currently the only way to guarantee any adequate support) and putting them onto a new legal status called a Kinship Care Order. Our response not only decries this despicable move to keep Kinship children and their carers in poverty and distress, but also points out that this discrimination between children in Kinship Care and their oftentimes brothers and sisters with comparable needs in foster care, is a violation of the European Convention on Human Rights. The SKCA will expose the Scottish Government’s disregard for Human Rights law in the coming year. 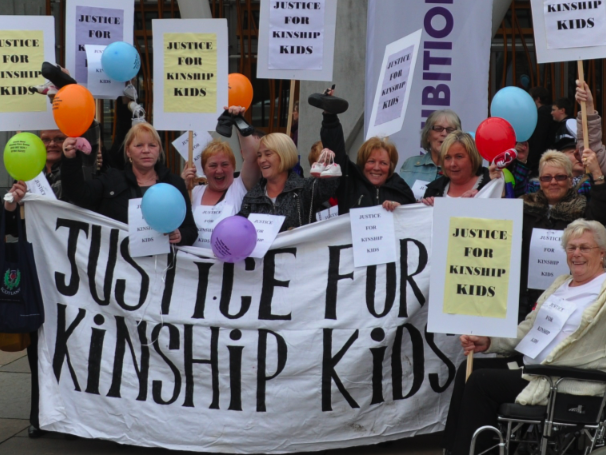 One of the most disappointing elements of the Bill’s ‘progress’ is the way in which the views of Kinship Carers have been outrightly ignored by the Bill team and the Scottish Government. We have had several meetings with the Bill team, and, along with other respected agencies such as the Scottish Human Rights Commission, the Scottish Commission on Children and Young People, Social Work Glasgow and the Poverty Truth Commission, have made the needs of Kinship children for basic support abundantly clear. However, the team have ignored our emotional stories and plentiful evidence and done the opposite. We are deeply concerned that there is an institutionalised discrimination within the Scottish Government, which has already condemned children in Kinship Care to the scrap heap. We will not back down and are building alliances to ensure Kinship children do get access to essential services and are given the chance these innocent children deserve in life. This entry was posted in Article, Kinship Care and tagged care, children, consultation response, discrimination, family foster care, foster care, Glasgow City Council, human rights, informal kinship care, kinship allowance, kinship care, policy, poverty, psychological services, Scotland, scottish government, Scottish Kinship Care Alliance, Social Work on July 29, 2013 by Miriam Rose. 9th July 2013. 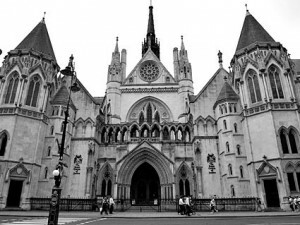 A case in Tower Hamlets, London, has resulted in another landmark ruling that Kinship Carers are entitled to the same level of support as foster carers. The ruling recognises that foster and kinship carers take care of children with comparable needs and vulnerability, and essentially do the same job, yet foster carers are very well supported and many Kinship Carers receive very little or even nothing. It is worth noting that the situation in Scotland is much worse than the case mentioned here, as very few Kinship Carers would receive the £200/week stated here. In fact the average Kinship allowance (which varies across Scotland and is only available to Kinship Carers on certain legal orders) is around £60/week. It is time a similar case was taken in Scotland to challenge the institutionalised discrimination between children in foster and kinship care here. Any lawyers do get in touch! This entry was posted in Article, Kinship Care, News and tagged children, discrimination, family foster care, foster care, human rights, kinship care, legal precedent, policy, UK government, Westminster on July 16, 2013 by Miriam Rose. May 1st, 2013. 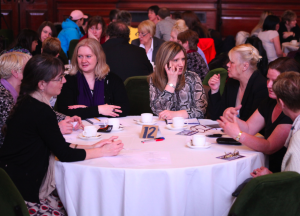 Scottish Kinship Carers from the Alliance spoke at Westminster in May, on the invite of the Global Women’s Strike – a global women’s network who have been campaigning for many years for women’s rights and recognition for women’s unpaid work. Jessie Harvey from Kinship for the Future (North) in Glasgow, and Anne Swartz, Kinship Alliance chair and chair of the West Dunbartonshire group joined other carers from around the UK to launch a petition calling for a living wage for all mothers and carers in recognition of the crucial role they carry out in society. 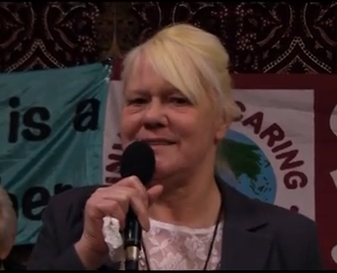 Jessie gave a moving speech to MPs and other carers which can be seen on youtube here. A letter to the Guardian newspaper entitled ‘Kinship Carers also need support’ was subsequently published, and the Alliance is now working closely with Global Women’s Strike. This entry was posted in Article, Event, Kinship Care, News and tagged care, children, discrimination, family foster care, foster care, human rights, kinship care, policy, poverty, scottish government, UK government, Westminster on July 16, 2013 by Miriam Rose.